You can even check out a curated playlist from the Engadget crew. Video game soundtracks hold a pretty special place in the Engadget Gaming crew's heart. Whether it's a collection of painstakingly curated licensed tracks a la Hotline Miami or wholly original compositions from Austin Wintory or Jesper Kyd, the right music can make a good game great and an excellent one even better. 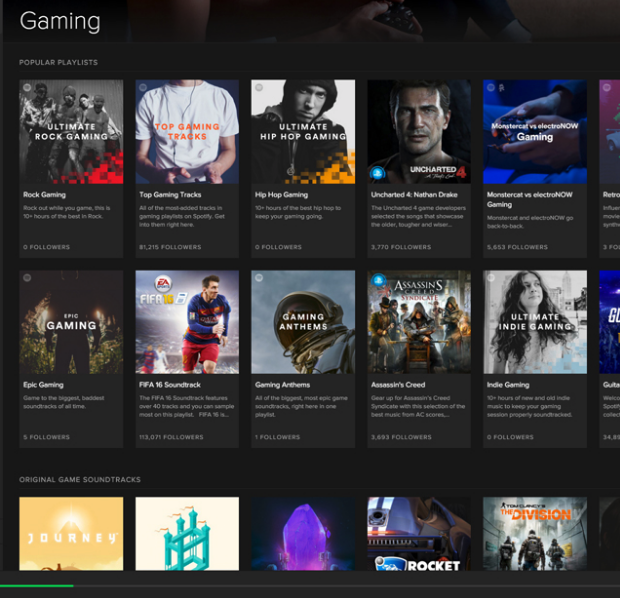 Spotify recognizes this too and is launching a new subsection dedicated to gaming music. The new collection brings everything under one category now (finding gaming stuff was a bit messy before), works across pretty much every platform and even includes chiptune stuff from the '80s. In addition to original music, Spotify is also featuring curated guest playlists including one put together by Engadget senior reporter Jessica Conditt and yours truly. Jess' tracks are upbeat indie tunes and K-pop from the likes of Regina Spektor, Janelle Monáe, Lily Allen, Girls' Generation and Amanda Palmer. Her games of choice for those? League of Legends and Pokemon Go. Walking around the park with "Mr.Mr." in your ear is going to make chasing the ever-elusive pikachu an awful lot more fun. My tracks will hopefully get you pumped while playing Overwatch, Rocket League or anything competitive. How's that? Well, because they're all metal, all the time, with Slayer, Urfaust, Abbath, High on Fire and Bolt Thrower making appearances. Our picks have been blended together into one 43-song playlist that should get you through at least one session without hearing the same track twice. For even more, head over to Spotify.com/gaming and let us know what you find in the comments below.